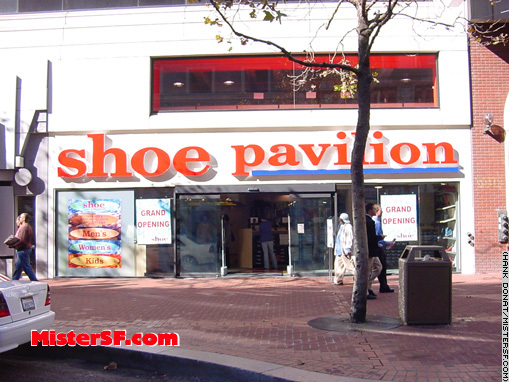 2670 Geary Blvd. The Lucky Penny restaurant is scheduled to close at 9 p.m. tonight. A fixture at Geary Blvd. and Masonic Avenue since 1972, this used to be a Copper Penny Family Coffee Shop until its owner broke away from that once-thriving restaurant chain. Forty-three years later, fans of the dive, located squarely in the heart of the City, have come out in droves to savor the final breakfast – or burger and fries, “extra crispy.” The Lucky Penny will be razed and replaced with a seven-story mixed-use building to include condos, offices, retail space, and underground parking. 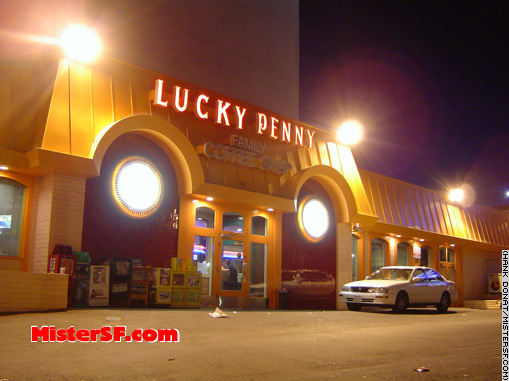 The Lucky Penny became Mister SF’s go-to greasy spoon after Tappe’s Sutter Street Bar and Grill shut down in 2005. However, the atmosphere and food quality at the Penny have declined in recent years. 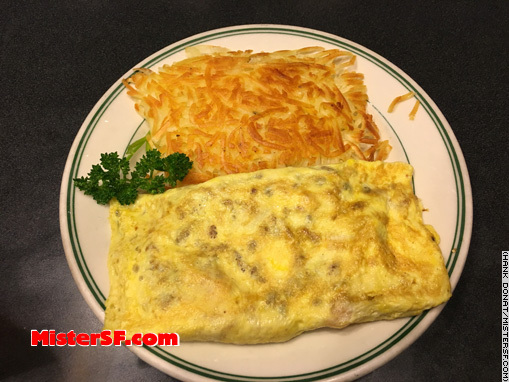 Since spotting a mouse in the dining room earlier this year, we’ve been having our hash slung at Mel’s, 3355 Geary Blvd. Now a veteran of several such closures of local favorites, Mister SF suggests that the Lucky Penny is reminding the gentle reader to enjoy everything while it lasts. There’s a penny for that thought somewhere, however, for the San Franciscan luck is always free. 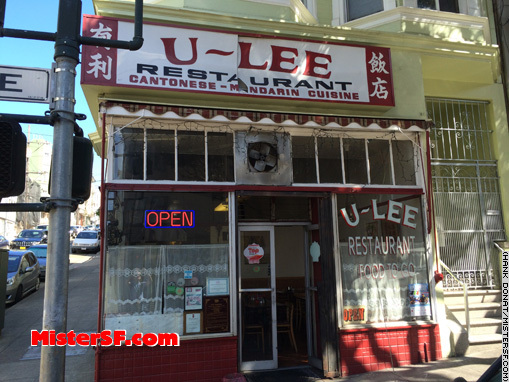 Dateline: 1468 Hyde Street, where Mister SF partakes of the final order of potstickers from U-Lee, as the restaurant closes today after 28 years. 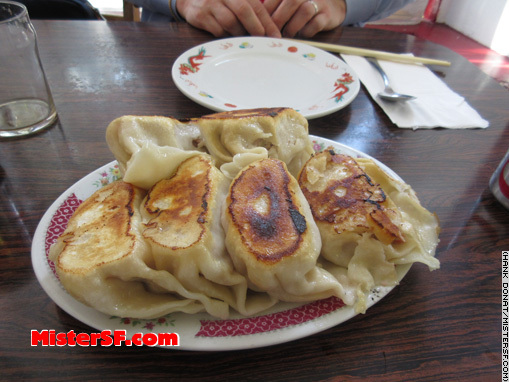 U-Lee was famous for potstickers that were not only delicious but also huge. They’ve been compared with fists and softballs more often than any other food item in San Francisco. Owner Ken Lee, who ran the restaurant with his parents, says plans are afoot for a new location near the Balboa Theatre in the Sunset District. Fingers crossed. U-Lee’s famous potstickers. As regulars, we tried to keep it a secret – their fried chicken wings were fairly giant, too. 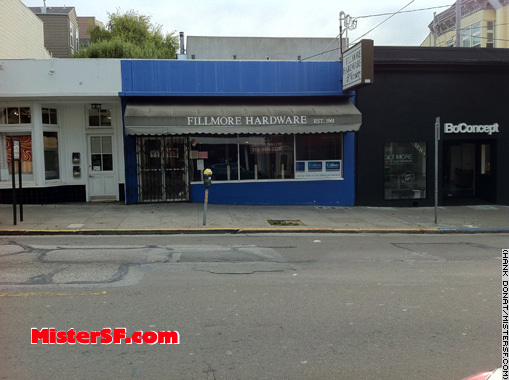 Fillmore Hardware, 1930 Fillmore Street, a fixture in the Fillmore for fifty years beginning in 1961. Thanks for helping me hoard all those incandescent light bulbs. Dateline: 1435 Polk Street, where Mister SF remembers Polk Street Hair Design, one of the last gay businesses on Polk. Dateline: The Goodwill Store, 1700 Haight Street, where Mister SF bids a fond farewell to thrift shopping. That’s right, the entire practice. Mister SF says ciao to the latest remnant of a fading fad of 1950s-style diners as Johnny Rockets leaves the Fillmore. 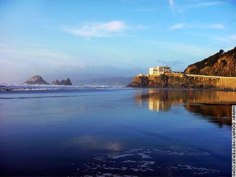 Mister SF says farewell to an Inner Richmond favorite. Mister SF visits the latest Farewell Favorite, San Francisco’s oldest bookstore, Fields.